Es werde Licht! - Let There Be Light! 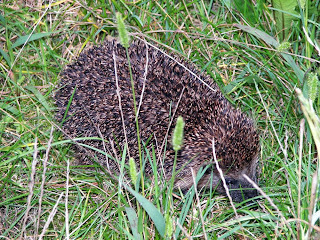 As we were keeping the cats inside, they weren't aware yet of another resident living in the garden - a hedgehog (der Igel)! Goodness knows what the people in the neighbouring rooms thought about the sound of four cats miaowing for their breakfast and to be let out! Before we set off we had to clean out the cat carriers. How do you do that in a tiny hotel room? 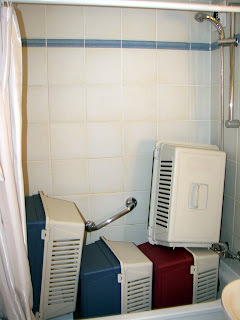 Well, there is a small bath and shower . . . I hope the hotel manager doesn't recognise this! 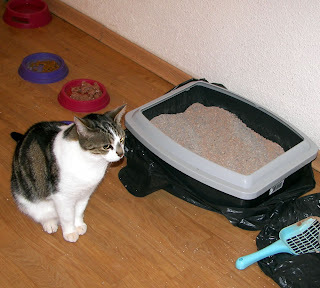 Before we left we cleaned up the room as best we could, sweeping up bits of cat litter and cat biscuits which had escaped. And then we had to extract the cats from under the bed where they had hidden. Of course the bed was too low to get under, so in the end we had to up-end it to get at the kitties. 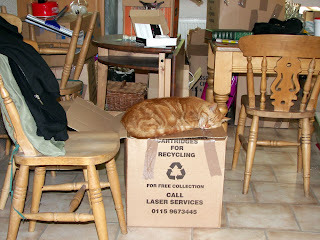 We opened the windows to try and relieve the odour of cat-food and litter trays, and surreptitiously vacated the room. I wonder what the hotel cleaner thought had been happening there, and did the smell linger for the next occupant? The drive to Berlin was a long, hard slog. We must have gone close-by some interesting towns - Bruxelles, Eindhoven, Duesseldorf, Essen, Dortmund, Hannover, Magdeburg, Potsdam, Berlin! - but the view from the car was of just motorway (or as we would call them in England, dual-carriageways) through flat urban landscapes. Driving on the right wasn't so bad when you got used to it, though giving priority to cars merging with the motorway from the right was a bit of a hassel, as they were coming at you from your blind-side. When we hit the German Autobahn that was an experience; you'd be happily cruising in the fast lane at 80 mph and seemingly out of nowhere there would suddenly be a Merc or BMW behind you flashing their headlights. Once you'd pulled in to the convoy of HGV's in the slow lane (still only two lanes, note) the Merc would speed off at 120mph or so. And that's legal in Germany! The cats were very well-behaved by now, with only the occasional miaow of protest. Somwhere just over the German border Tosca got really vocal, and would have stamped her foot if she could. We stopped at a lay-by and found that she had made rather a mess in her carrier. It was so bad that My Other Half investigated the lay-by toilets to see if it were possible to smuggle Tosca and the carrier in to give them a clean-up, but unfortunately the toilet doors had gaps under them and we didn't want to lose Tosca to the countryside of middle-Europe. We evetually arrived in Basdorf as the sun was setting. The removal van had made it before us and was waiting to unload. Unfortunately his Germany-side assistant wasn't there to help with the unloading, as the removal man couldn't get his mobile phone to work on the continent. It was now starting to get dark, and there was no electricity connected to the house yet. An hour or so later and we managed to get hold of the assistant, and unpacked the rest of the van by torchlight. It was about ten-thirty when we had finally done and settled into our (dark) new home. We made a cup of tea on a camping gaz stove and settled down for a good night's kip in sleeping bags with some rather bemused cats. This morning we set off on the long journey to our new home. We left at nine a.m., before the removal men arrived, and set off for the channel tunnel with four cats on board. We were averaging about 100 miaows per mile for the first hundred miles or so, until the cats settled down into a grumpy scowl at us through the bars of their pet carriers with only the odd plaintive meowl to stop this nonsense and let them go home. Above are from left to right Simba, Tosca, Suki and Cassie in the back of the car at a service station on the M1. God, I hope the RSPCA aren't looking at this! There was the odd little 'accident' on the way down, necessitating a cage clean-out without letting a cat escape from the car and trying to find their way back up the motorway (of course cats are useless hitchhikers; no thumbs you see. So they wouldn't have got too far). Needless to say, it was getting a bit smelly with the 'odour of fear' in the car, Cassie in particular kept letting off some fruity exclamations. On the whole the cats travelled fairly well (either that or it was the copious amounts of Felispray drugging them), and took an interest in the motorway traffic. Tosca got rather scared though when we went over the Dartford Queen Elizabeth II bridge; I think she thought we were going to take off as we drove up and over the Thames. 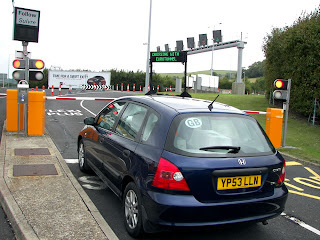 Eventually at about 3pm we arrived at the entrance to the Eurotunnel. Surprisingly, no-one wanted to see our passports, or the cats passports and documents (which made us wonder why we'd forked out so much for them), and we were waved straight through and onto the train. 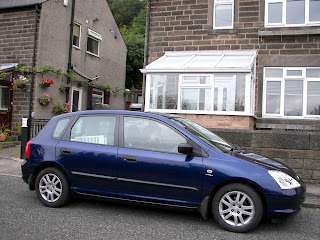 Here is a photo of the car at the head of the queue waiting to board. Once through the Chunnel we drove East through northern France into Brussels to finally arrive for the night at a cheap hotel outside Brugge (Bruges). When we booked the room, we asked if they allowed cats. Yes they said, as long as they are quiet pussies. Our little angels? But of course! So, we ended up in a small chalet-type hotel room with not enough room to swing a cat (!) and had to somehow fit in four cat carriers, two litter trays, and four feeding bowls. We also had to cover the bed-sheets with a plastic sheet in case Simba took his revenge and wee'd on it in revenge(something he'd done before when we'd moved house). This and try and get in and out of the room without allowing a cat to break for freedom. 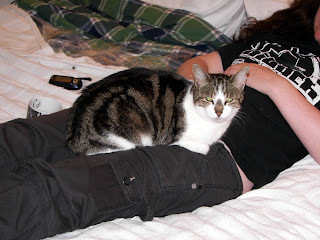 Tosca, at least, settled herself in (below). The rest of the cats remained hiding under the bed. I am sure Brugge is a beautiful town. Unfortunately we only saw industrial estates and the inside of our small room. The local television stations were interesting though, in a choice of either French or Dutch. French I am ok with, but Dutch sounds like German would after you've spent too much time in an Amesterdam coffee-shop. Which reminds me of a classic Dutch commercial with John Cleese. We are not even half way yet, and only 850 km to drive tomorrow! Gute Nacht! 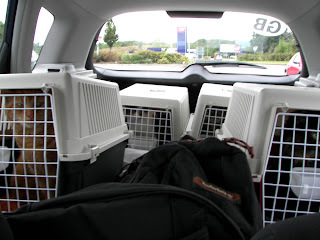 Tomorrow we are driving down to the Eurotunnel terminal (with four cats don't forget!) and across to Dunkirk or possibly Bruges. Tuesday we then drive to Basdorf bei Berlin and our new home. We have borrowed a car for the trip from a kindly relative, but this means that then my Beloved has to drive all the way back to the UK Midlands (this time via the Rotterdam-Hull ferry) to return the car, then fly back to Berlin. I, meanwhile, have to get the house in Ordnung and passify four homesick cats. I am sure it will all go swimmingly, and thanks to everybody, family and friends, who have given their support and best wishes. I don't think many of you thought we would actually go through with this change, but thanks to your encouragement we are about to make our dream a reality! Vielen Dank! And see you in Basdorf! p.s. okay, I know that the mien of this blog might suggest we wanted to get to Berlin, but hey, we are just on the outskirts of that wonderful city and in a place which also begins with 'B'. When you are aiming a dart from a thousand kilometers away, that's almost a bulls-eye!